I was at a local outdoor shelter taking photos for the website I did for them. While I was there, the shelter manager said "I want to show you a strange dog". 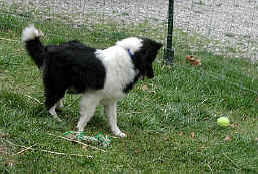 We walked over to an area away from the main outdoor kennels and there was this little black and white sheltie. He was cowering in the corner and seemed afraid of everything. I could see he had buried his bowl of water and food in the dirt. The manager told me that she felt he was either stupid or crazy. As I approached the dog, I could see his eyes were very strange. 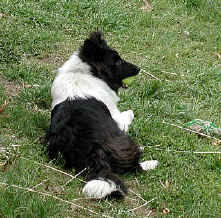 I went into the kennel with him and with some coaxing, he came to me and laid down by my feet. He became more relaxed as I began petting him and talking with him. It did not take me long to figure out, he was blind. I had no way of figuring out if he was permanently blind or temporarily blinded. He was so afraid that I told the manager that I would take him home and try to get him into a rescue group. He was a very sweet and beautiful dog. He rode home in the car without any problems. I could tell that he had never had a leash or collar put on him, but he got accustomed to them quickly. Since we had so many other dogs, I kept him in the attached garage. I cleared everything away that he could run into. My husband put up a temporary fenced area where he could play by himself. He really enjoyed his own little space. He adapted quickly and I worked with him to teach him to walk and heal. He was a very smart little Sheltie. 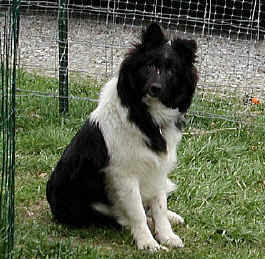 I tried to get several Sheltie Rescue groups to take him, but they were either full or did not want to take in a blind dog. So he continued to stay with us. 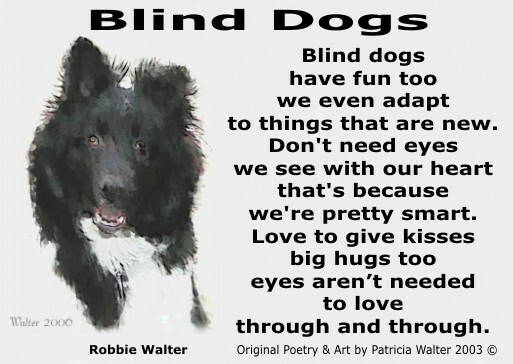 We took him to a Dog Ophthalmologist at Ohio State University who assured us that he was born blind. He never could see and never would be able to see. One eye did not even have a retina in it. I told him we were trying to find Robbie a new home. The vet sat on the floor feeding Robbie biscuits and told me that we should keep Robbie since he had done so well with us. He did not want to see Robbie bounced around from home to home. I explained that we already had 12 dogs, but he still felt Robbie should be with us. So Robbie stayed with us. 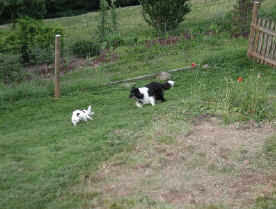 Gradually he meet all of our dogs, one on one. We moved him from the garage into our kitchen where we kept him in a crate when the other dogs were around. That way they could smell each other, but he was safe. Then slowly we would let him share the house with the other dogs. He gradually felt right at home with all 12! It was an amazing process to watch. 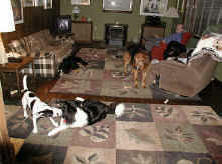 I never felt that he could become comfortable living with that many dogs. But he now lives with 16 other dogs. He usually stays in the kitchen area since he has special toys and his own bowl of water. 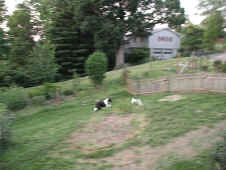 He does run around the house with the other dogs some of the time and always goes outside in our large fenced area with the other dogs. 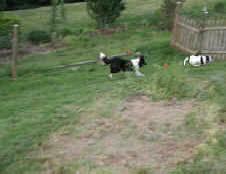 He loves to play tag, running full speed in our yard. You would never know that he was blind. 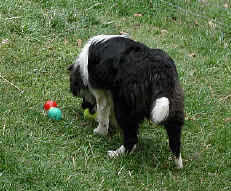 But if someone forgets and leaves a lawnmower or something in his way - he is really blind and will run right into it. He knows every bush and tree in our large yard and navigates just like he has eyes. He is a wonderful dog that is very smart. no need for any one else at all. 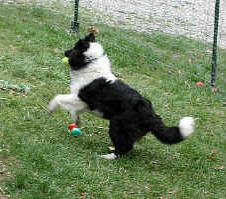 no - playing ball is his joy. still loves his ball best. 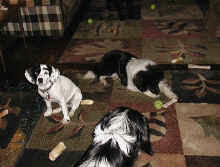 Blind dogs have fun too! Robbie has learned so much since we adopted him. He can heal, ride in the car, is housetrained, crate trained and learned to live with 16 other brothers and sisters and 3 cats! He is amazing. 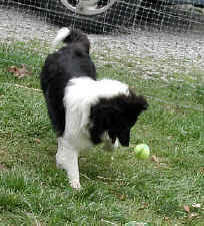 He loves to play tag at full speed in the yard with Sweetie, wrestle with Charlie the Springer and throw his toys around the kitchen. I think he has a smile on his face all the time. to things that are new.